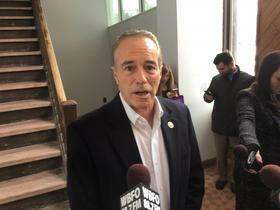 BUFFALO, NY (WBFO) – A trial date of Feb. 3, 2020 has beens set for the federal insider trading case involving Rep. Chris Collins. Collins, his son Cameron, and his son’s future father-in-law, Stephen Zarsky, were charged in August in an alleged scheme involving an Australian biotechnology company on whose board of directors Chris Collins served. Federal prosecutors allege Collins passed on information about a failed drug trial so his son and Zarsky could sell stock in the company before the results were publicly released. All three have pleaded not guilty. U.S. District Court judge Vernon Broderick is presiding over the case in the Southern District of New York. The trial will be held in Manhattan. Collins, a Clarence Republican, suspended his re-election campaign a few days after the indictment was announced. But he reversed course last month, announcing he would stay in the race and actively campaign. Collins faces Democratic Grand Island supervisor Nate McMurray in next month’s general election for New York’s 27th District.